Cut pattern was altered for bust 38 inches, FYI. 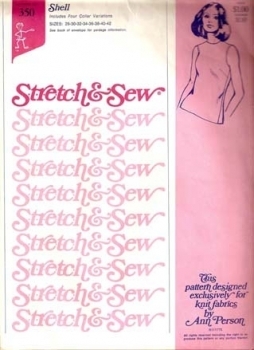 It suggests using fabrics with at least a 25% stretch. We specialize in one-of-a-kind originals from the 1960s and 1970s with a handful of reproduction items and a few from other eras thrown in for fun. All clothing and collectibles are pre-owned unless otherwise stated and sold as described. Please read descriptions for details and e-mail before ordering if you have additional questions about size, condition, authenticity, etc. Exact measurements are given in inches, and in some cases, centimeters. Please feel free to call or e-mail your sizing concerns before placing an order at groovlanaj@groovyjuice.com or 650-344-6977 in San Mateo, CA, which is Pacific Standard Time. Your privacy is important, Groovy Juice does not share addresses or information, and will never spam you. However, I am doing business with third party sites corporate sites like Paypal, Google and Ebay who might track you with software, cookies etc. These make it easier to identify that your order originates with me. . . not anything that would harm your computer. Thanks for your understanding. Items are shipped 2-3 day priority USA priority mail in flat rate boxes unless otherwise noted. Sewing pattern orders are mailed first class mail unless otherwise requested. Handling time is withing 1-3 business days normally. If you need special shipping exceptions we may be able to help. Please call or e-mail if you would like us to use your existing fed ex or UPS account number or make other arrangements such as USPS Express or International Shipping rates. Please e-mail groovlanaj@groovyjuice.com or try calling 650-344-6977. Calls are returned ASAP although I might not always be at the telephone. Leaving a detailed message always helps speed up your order. Insurance is optional, but recommended and we might require it on especially expensive, fragile or breakable items (like electronics or glass) or during especially busy times (Halloween, Christmas) to cover our risk. Thanks for your cooperation. If you buy more than two items at one time and send it to the same address, shipping costs can be combined to save money. Just let me know. If you do not say anything, you will be charged full shipping rate since my cart defaults to this setting. Clothing items may be returned within three days ONLY if the item does not fit. E-mail me as soon as you get the package . .. your refund will be issued once the item arrives in the same condition that we sent it. . .
COMMON SENSE STATES that clothing items must be returned in UNWORN, UNWASHED and in the exact condition we sold it to you in. Groovy Juice is not responsible for any damage that occurs to the clothing after you get it. In plain language. . .If you buy someting, wash it and it shrinks and THEN doesn't fit you sorry. . . can't return the item!!!! If you bought it and then tried to iron it and put a hole in it with your steamer, sorry can't return it!! Sewing patterns, fabrics remnants, record albums, toys, magazines, accessories and collectible items are not returnable unless the item (on rare occasions) is missing a piece or other unanticipated flaw. Because of this, ask for additional photos or all information possible BEFORE ordering these items to avoid any confusion. Money will be returned to your Paypal once the item is returned (Allow restocking time and time for the mail to return your item- and more time during holidays and rush times). Paypal allows a refund option for up to 60 days, but I try to get refunds out as fast as possible. If there is a problem with your cut sewing pattern order, just send an e-mail when your order arrives and I will work with you to replace or complete the pattern. If a pattern isn't complete and it slipped by me you won't get burned. BUT CHECK BEFORE YOU CUT THE FABRIC, common sense. I am happy to check pattern completeness for you beforehand. IMPORTANT- Print a copy of the item you are ordering for your own records, as this description will disappear from the site after placing an order, and you will need this in the event that you make a return. I also encourage you to print a copy of this policy, which is subject to change. You must check the "I Agree" box to continue. © 2019 - Lanajean Vecchione, DBA Groovy Juice.com. All rights reserved.